The clouds lie still among the hills. As if placed there. Not by the monsoon winds that never stop in their path – these seem to be held there intentionally by the trees. We were looking up at the hill from an opening in the woods. The essence of evergreen forests of the Ghats during monsoon is enthralling. The sheathed hills grow ever more mystical. I told my friend – my silly imagination taking over – of how I wished to see King Kong come bustling down the hill, or at least see trees swaying briskly by some giant’s movements. Trampling in the great undergrowth abound with leeches, we ducked whenever the sinuous arms of giant lianas straddled across our paths, hopped over rain-soaked logs, and skipped over polished boulders in gushing streams. The forest was dense and damp. Not a bird sang. Only a few yards in I noticed the forest path riddled with footwears, from sports and soccer shoes to chappals and heeled sandals. A curious thing to find in the forests. As we ventured deeper still, we found shoes hanging on the trees, and shoes torn to pieces. Not the unlikeliest of the things to find in a forest but curious nonetheless. The forest cast a sullen blue-green glow under the monsoon clouds. In this faint light, we see thing with much more intensity. My pupils dilated when I caught the first glimpse of the Medusa’s head resting against a large tree – the crown of the Rattan Cane, Calamus rotang. At the second – and the strongest – stream we crossed, the cane grew denser. For those who have not met Calamus, it is the personification of the perils one may befall in the Ghats. It is a flexible palm species that grows like a creeper. Its sinewy stem is riddled with spines so sharp and thin that one rub against it and they get lodged in the skin. Its leaves, the shape of coconut fronds, are also abhorrent for the herbivores – they have spines on their edges and on top as well as below the surface. The stems that grow old contain flatter, thicker thorns pointing downwards. As the cane climbs trees using its spines, it sends down tendrils with hooked spines all across their length in all directions. My friend felt someone – or something – tugging and pulling her upwards when she realised it was one of the cane tendrils that had caught her by her shoulder. Then it caught her again. And that’s when I realised what was happening. It made no sense for so many to discard their shoes on such a long and winding trek. There were forces at work, creeping above our heads, oblivious to us, as we began our short little adventure. The shoes lay there because their wearer did not need them up in the canopy. The number of footwears increased as we ventured further deeper into cane territory. The tendrils slowly grouped together. The forest grew ever silent, save cicadas singing their distorted tune, or a lonesome cricket in a bog. This forest was much more alive than we thought. The tendrils were hooked arms of a silent killer. And its mouth lay higher up in the canopy, watching from its rain-soaked, snake-like fronds. There were eyes on us, above us, all around us in the form of a network of long, Medusa-headed cane omnipresent in this grove. We felt it shuffle its tendrils as if the breeze shifted it. One caught me by my collar, and the further I moved the more it tugged at me. A few of us got lost between two groups, one in the front and another behind us. At this point the jungle appeared to be closing in. The paths suddenly broke off in many directions. Only the echoes called back when I shouted. Our imaginations were running pretty wild by this time. It wouldn’t have been a surprise if the forest was intentionally disorienting us by using some narcotic gas or by simply changing the dimensions of the forest. By this time we were deep in our theory. Anything was possible. What was numbing was the hypnotic silence of the forest. Not even a mosquito buzzed. The cane ruled this place. It was the man-eater. Save for the footwears left behind by the victims as they were pulled up into the dense canopy, there was no trace of humans in these hills. We were in its trap. “The slender and delicate palpi, with the fury of starved serpents, quivered a moment over her head, then, as if instinct with demoniac intelligence, fastened upon her in sudden coils round and round her neck and arms: then, while her awful screams and yet more awful laughter rose wildly to be instantly strangled down again into a gurgling moan, the tendrils one after another, like green serpents with brutal energy and infernal rapidity, rose, retracted themselves and wrapped her about in fold after fold. ...” (The Man-Eating Tree of Madagascar by Edmund Spencer, 1874). If this tree sounds like Calamus to you, you’re not alone. But Calamus isn’t as animated as Leche’s tree. It works silently, like an ambush predator, but displays primal fervour as soon as someone is trapped and is pulled up – Leche’s description of what happens to its victims are a better representation of what follows next. We did not want to be eaten by a tree. Come what may, we decided to stick to the group for most of the journey and came back unscathed. The abandoned shoes, the hooked tendrils always trying to encircle us, and Leche’s man-eating tree give credibility to our theory. The deafening silence of the forest, a sense of being lost, and the feeling of being watched increase our hold on our theory. Deep in the forests of Goa, the man-eater cane exists. We want it to be true because we believe in it. Or, to quote a more famous rendition of this sentence: “I wouldn’t have seen it if I hadn’t believed it” (Foster et al., 1975). We observed, we formed a hypothesis, and we drew our conclusions. In scientific studies, about 70% of the results of some observation-based studies go in the direction of their expectancy (Rosenthal, 1969 in Blaph and Blaph, 1983). The authors write, “This figure rose to 100% among observers of animal (as opposed to human) subjects.” In other words, welcome to the world of observer-expectancy bias. Observer bias is the bane of a human researcher (it is said that computers are better). To put it simply, we introduce observer bias in our conclusions when our results are influenced by our expectations of what we are observing. Studying nature is riddled with biases which mostly come innately for us. The simplest example of how observer bias affects us is how it influences the bias in funding research projects – a majority go towards mammalian and bird research because of our innate affinity towards them. They are more visible, and hence (seemingly) easier to study than fishes, anurans, reptiles, and invertebrates, which are also equally (in fact, more severely in some cases) threatened with extinction. I do not mean that there shouldn’t be a priority group of species for conservation, but the general consensus that protecting one charismatic species protects an entire ecosystem is riddled with observer biases. In fact, protecting one charismatic species can and has driven another species on the edges of their primary habitats where they invariably face greater dangers for survival – such is the case of the Indian wolves in many of India’s tiger reserves. There are several reasons how these biases crop up, and Wikipedia has articulated these for easier understanding (see it here). In case of the man-eater cane, let us see where all the biases in my observations lay. The abandoned shoes. They were all over the place. However, we did not see a single soul in the forest that day save for a young couple who soon vanished when three dozen of us came marching on the same path. Cane is a notorious plant. Anyone who has worked in the evergreen forests of the Western Ghats are fully aware of the harm it can do to your clothing and skin. I call contact with Cane ‘a kiss of death’. I have a long association with this plant, and I am more afraid of it than a cat snake’s bite or a paper wasp’s sting. The silence of the forest. In all my walks I have never come across a forest so still and quiet. Save for the gushing streams, there was no call of a bird except a few isolated chirrups in the distant canopy. There were no mammal droppings on the path, and barely any of the iconic insects of the Ghats, such as the scorpionfly, save a few butterflies, cicadas, and beetles hiding in the thicket. 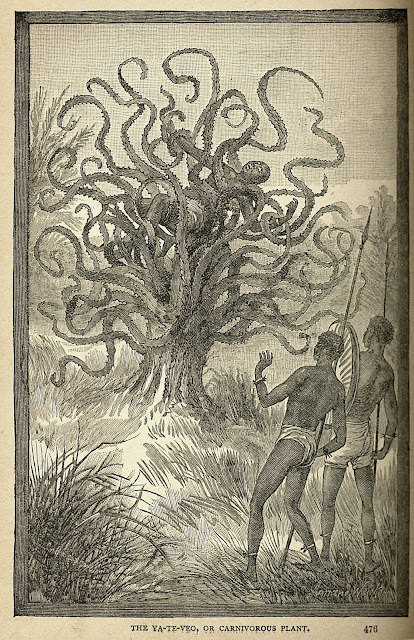 The Man-Eating Tree of Madagascar. Leche’s disturbing, graphic account of this tree, and its superficial resemblance to Calamus, made me sit up and have another cup of coffee. I was on the right track! Or was I just fantasizing too hard? If you were to venture into this same forest, with the knowledge of the man-eater cane that I shared with you, chances are you wouldn’t believe me, but you would be curious to find out what really it was that made me believe in this ridiculous idea. Chances are, you’d want to find out for yourself to disprove my theory how-much-ever ridiculous you think it is. 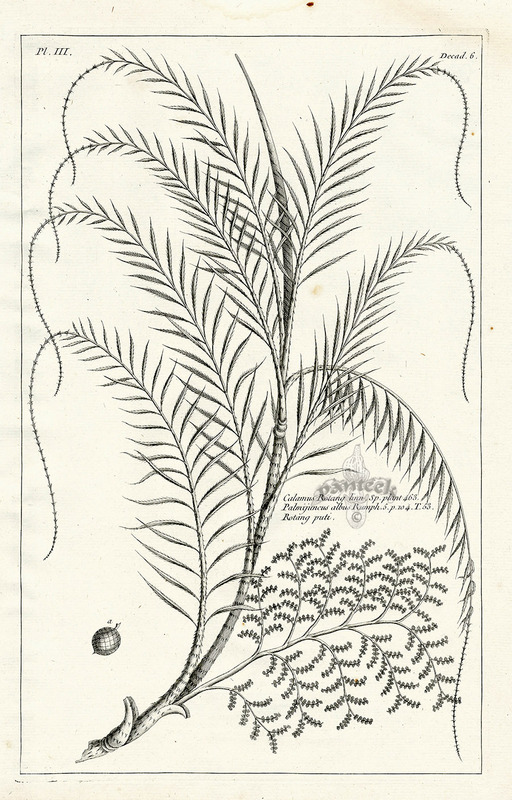 Calamus rotang, P. J. Buchoz Herbier Artificiel Botanical Prints 1783. Copyright, PANTEEK. link to original, link to main website. And to prove me otherwise, you’d at least have to assume my theory to be true to prove it wrong. In case of Crinoida dajeeana, it generated great interest and was picked up by several news outlets. People believed it to be true to the word. An honest account of the most horrible tree in existence. Many explorers in the 1900s went to Madagascar to look for this tree – even those who disapproved of it. This was likely because it was published in journals with credibility, introducing a bias in our understanding of this vague subject. Believe in what you see? found in both Africa and Central America, from Sea and Land by J. W. Buel, 1887. Pennsylvania: Historical Publishing Company, pp. 475-477. Original source. Fortunately (or unfortunately for some) it took a while to falsify Leche’s findings – in fact, there is no tribe by the name Mkodo. Crinoida dajeeana was a figment of Spencer’s wild imagination come to life. My argument in favour of the man-eater cane comes from what I believe to be evidences that suggest it is true. And while more logical reasons exist, I chose to go with what I had. You can call on my bias by using logic over belief. This is where Occam’s razor comes into play. Often the simplest solution tends to be the right one (Wikipedia on Occam’s razor). In statistical terms, “when competing with competing hypotheses to solve a problem, one should select the solution with the fewest assumptions.” In statistics, the most parsimonious of models are selected to be the best fit for a theory you are trying to prove. The man-eater cane theory relies heavily on borrowed inferences and assumptions. This makes it complex to prove. On the other hand, disproving it based on logical reasoning is likely to be the most parsimonious because of its simplicity – but I leave it to you to do so. When I woke up the next day, I found a strange long scar on my forehand. If this is how the tree marks its victims, this theory just got a lot harder to refute unless I go back into those hills. I get shivers imagining that creeping cane breathe and heave and stretch and shuffle in the darkness of the Ghats. Who will become its next prey?